Having trouble managing where all the important files for your art business live? Artwork Archive has built a new library for you to upload, store and share all of your most frequently used documents for your art business. With My Docs, you can now store your artist statement, bio, resume and much more side-by-side with your art inventory, sales insights, and contact information. Even better, you’ll be able to package and send these documents directly from your Artwork Archive account to the people who need them. 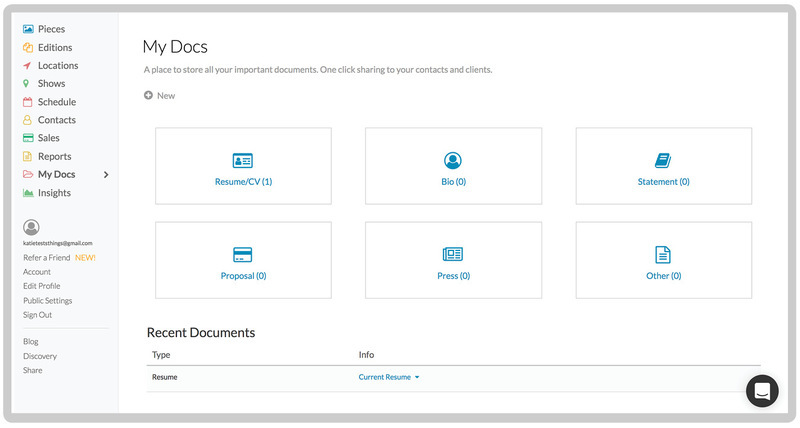 To get started to go My Docs on on the left-hand menu and start uploading your documents. By clicking New you can upload any document type and categorize it into it's correct folder. Your most recent uploads will also show up on the bottom section under recent files.